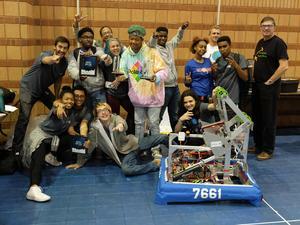 Congratulations to the Sci High Robotics Team! At the FIRST Robotics Bayou Regional Competition held March 21-23, the Sci High Robotics team won the Rookie All Star Award for outstanding rookie effort on and off the field. Additionally, they earned the Rookie Seed Award for being the highest placing rookie team. The team, in their first year competing, ranked #20 out of 59 teams, making them the highest ranking of all first and second year teams. Their effort this year qualifies them to compete in the World Robotics Competition in Houston, TX during spring break! A special congratulations to their instructors, Nick Chvany and Rae Goldman, for their tireless commitment to this program and, most importantly, their students.